On Sunday, more eyes than usual will be on the N.F.L. as the league begins to strictly enforce safety initiatives that limit hits to the head, players’ launching themselves into opponents, and gratuitous hits against defenseless players. Under the threat of stiffer penalties like suspensions, players will be scrutinized. They are being instructed to take new angles and to concentrate their force on a new strike zone, which is essentially anywhere below the head. In some ways, N.F.L. players are being made scapegoats in response to a news media outcry over the legalized mayhem known as professional football. While hockey players regularly drop their gloves and pummel one another — some even take on fans — N.F.L. players are being told, midstream, to curb instincts that have been cultivated since the sixth grade. On the other hand, the N.F.L.’s knee-jerk reaction to the relative carnage of last Sunday could be beneficial if it encourages players to act less like blood-lusting gladiators and more like well-compensated professionals who play a uniquely violent game. What may come out of this, oddly enough, is greater compassion among players, a recognition that they are all in this together, that they need one another. If the players don’t know this now, they will in about five months when their owners lock them out. 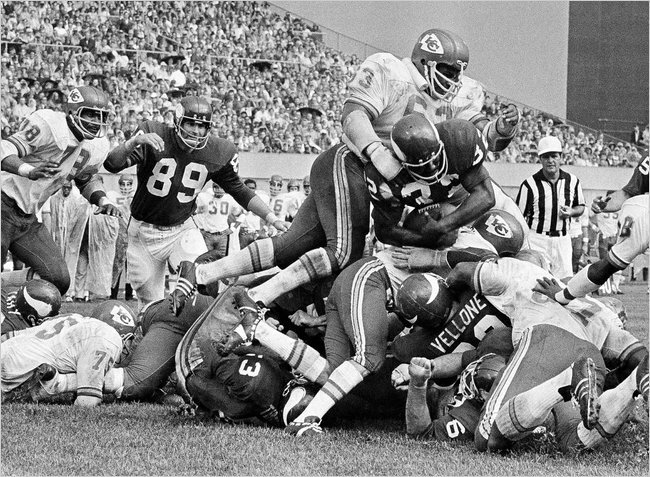 Willie Lanier, regarded as one of the greatest middle linebackers in history, had that epiphany 43 years ago during his first season with the Kansas City Chiefs. Lanier, who starred at Morgan State, was known as Contact in his rookie season because of his bruising headfirst hitting style. A week later in a home game against Houston, Lanier collapsed while calling defensive signals. “I was out for two hours,” he said. Lanier did not find out until the end of his career that his pulse was lost three times on the way to the hospital. By the end of his rookie season, Lanier had changed, going from Contact to Honey Bear. Lanier, like everyone else in his generation, had been trained to put the crown of his helmet between a ball carrier’s numbers and hit, lift and drive. In the Honey Bear approach, he utilized his chest, shoulders and arms to wrap up, or bearhug, a ball carrier when bringing him down. The change was not ordered by the Kansas City coaching, training or medical staffs. The league did not order it; indeed, the league did not know. Lanier said that he was not reacting to a rules change, but to a reality that he had to change for his own sake. Lanier took ownership of his body, his health. The current generation of active players needs to do the same. “There is no way that I could have survived if I had not changed my style of play,” Lanier said. He played 10 more seasons. He did not miss a game. He did not sustain any more concussions, and his tackling efficiency improved. More significantly, Lanier said his mentality changed from one bent on destroying the opposition to one that ultimately looked out for his opponent. For the sake of the game, they needed one another. They needed the great players on the field. The former running back Calvin Hill was one of the first beneficiaries of Lanier’s enlightened attitude. Hill, who played for Dallas and Washington, and in the World Football League, recalled an exhibition game against the Chiefs when he hurtled over Lanier at the goal line to score. Lanier recalled the conversation. He said he told Hill the only reason he didn’t hit him was that it was a preseason game. Lanier also told Hill that whenever he left his feet, he made himself vulnerable to harder hits and put himself at risk of serious injury. Lanier’s talk about compassion is not just an old-school lament. Decades later, a number of contemporary players are beginning to make the same point. The Giants’ Justin Tuckmade it last season. Athletes are told from childhood: don’t think, react. Now the N.F.L. is telling players to think first. At a number of levels, that is advice they should heed. Very well written post! I was completely unaware of Lanier’s story and appreciate what he did for the game of football and for the NFL. I didn’t realize he had changed his style of play – I truly believe more players in the league need to hear his story.